"Feline urinary infection (UTI) is caused by bacteria that enters the body through the urethra, which is at the point where urine exits the body. 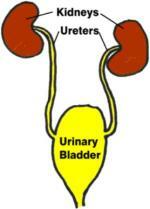 Bacteria can move up the urinary system and then infect the bladder. Symptoms are sometimes non-existent , but they do occur are due to the inflammation that accompanies the infection. UTI is usually not seen in cats under the age of 10. Diet can result in an infection if it leads to crystal formation, a condition called cystitis.Treatment is with a 10 to 14 day course of antibiotics. "A cat urinary tract infection refers to inflammation with infection. The disease Feline Lower Urinary Tract Disease (FLUTD) is a different condition that refers to inflammation in the urinary system without the presence of infection." Feline urinary infection (UTI) affects between .1% and 1% of cats. It is the cause of feline lower urinary tract disease (LUTD) in 1% to 12% of cats. Infection can be found in either the upper urinary tract, lower urinary tract or both. It is often the case that infection that begins in one part of the urinary tract infects the other parts as well. Infections are caused by both bacteria and fungus. eColi is the cause in approximately 46% of cases and Staphylococcus spp. in 9%. Infection sets in when the bodies normal defense, urination, is not enough to flush the bacteria from the cats system. Crystal formation could also cause a blockage, allowing bacteria to colonize in the urinary tract causing a feline urinary infection. Cats have a significant amount of bacteria where urine exits the body. If the bacteria, after entering the body, travels from the outside to the bladder then an infection forms. Diabetes Mellitus (one study shows that 10% of cats with diabetes had an UTI). It is possible not to notice any symptoms of this condition. When symptoms do exist, often, like in people, there is a burning sensation caused by the bladder infection. If you notice any sudden behavioral change when a cat is urinating, its time to take your cat to the veterinarian for testing. A similar condition is called FLUTD, FUS, Feline Urologic Syndrome and cystitis which is a feline lower urinary tract disease. This problem is caused by inflammation in the bladder that is not caused by infection. Symptoms can be similar to UTI because both are caused by inflammation in the same area of your cat's body. Your veterinarian will take a urine culture for testing (urinalysis). The veterinarian will examine the urine sediment. The hard part is taking a urine sample that has not been contaminated by the environment or by your cat's lower urinary system. This can be done by a process called cystocentesis (puncture of the bladder for the purpose of obtaining an uncontaminated urine sample). This approach is superior for avoiding any contamination of the sample vs. an older approach which was to insert a catheter into your cat. Othermethods such as catching urine is also prone to introducing contamination that could result in a false read of the results. Urine should be tested immediately after being captured to avoid having the bacteria multiply before the urine is tested. Antibiotics are used to kill the bacteria which is causing the infection over a 10 to 14 day period. 85% of cats that receive treatment are cured of the UTI and see no recurrence of the infection. Your veterinarian will determine if there was an underlying problem which allowed the bacteria to take hold. If your cat frequently gets bladder or urinary tract infection, you might want to consider a natural remedy to support the bladder and urinary system. One product made for this purpose which is worth researching is PetAlive UTI-Free Formula for pet urinary tract infections. It contains natural ingredients such as Arctostaphylos uva ursi which helps maintain normal pH levels in the urinary tract. (Larsson B, Jonasson A, Fianu S. “Prophylactic effect of UVA-E in women with recurrent cystitis: a preliminary report.” Current Therapeutic Research 1993;53(4):441-443. ). Be sure to check this and any other remedies with your veterinarian. The key to cat urinary tract health and feline urinary support is staying hydrated. The more hydrated your cat is, the more often he or she will urinate. Urination is the way nature cleans the bladder and prevents infection. It also helps to prevent stones, which can block the urinary system, from forming. Cats naturally do not drink a large amount of water and get much of what they need through their diet. This is why many veterinarians such that cats that are slightly dehydrated switch to a "wet" or canned diet vs. dry kibble. Bacteria can also enter your cat from a dirty litter box. Be sure to keep the box clean.